A graphic representation of how atomic layer deposition can aid renewable hydrogen fuel generation. Two papers published in Proceedings of the National Academy of Sciences show how atomic layer deposition can make water-splitting devices more stable and more efficient. Splitting water into its components, two parts hydrogen and one part oxygen, is an important first step in achieving carbon-neutral fuels to power our transportation infrastructure – including automobiles and planes. Now, North Carolina State University researchers and colleagues from the University of North Carolina at Chapel Hill have shown that a specialized coating technique can make certain water-splitting devices more stable and more efficient. Their results are published online this week in two separate papers in the Proceedings of the National Academy of Sciences. Atomic layer deposition, or "ALD," coats three-dimensional structures with a precise, ultra-thin layer of material. "An ALD coating is sort of like the chocolate glaze on the outside of a Klondike bar – just much, much thinner," explains Dr. Mark Losego, research assistant professor of chemical and biomolecular engineering at NC State and a co-author on the work. "In this case, the layers are less than one nanometer thick – or almost a million times thinner than a human hair." In the first paper, "Solar water splitting in a molecular photoelectrochemical cell," the researchers used ALD coatings on nanostructured water-splitting cells to improve the efficiency of electrical current flow from the molecular catalyst to the device. The findings significantly improved the hydrogen generating capacity of these molecular-based solar water-splitting cells. In the second paper, "Crossing the divide between homogeneous and heterogeneous catalysis in water oxidation," the researchers used ALD to "glue" molecular catalysts to the surface of water-splitting electrodes in order to make them more impervious to detachment in non-acidic water solutions. This improved stability at high pH enabled a new chemical pathway to water splitting that is one million times faster than the route that had been previously identified in acidic, or low pH, environments. These findings could have implications in stabilizing a number of other molecular catalysts for other renewable energy pathways, including the conversion of carbon dioxide to hydrocarbon fuels. 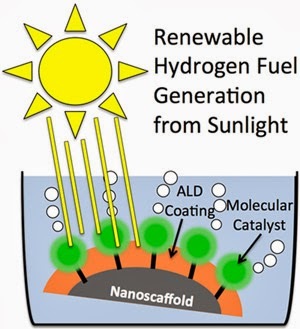 "In these reports, we've shown that nanoscale coatings applied by ALD can serve multiple purposes in water-splitting technology, including increasing hydrogen production efficiency and extending device lifetimes," Losego said. "In the future, we would like to build devices that integrate both of these advantages and move us toward other fuels of interest, including methanol production."